When you hear the word storm what comes to mind? Do you prepare for the worst and cancel any plans you’ve made to fish? No! Not in this case these guys came from Northern CA and were not turning back. 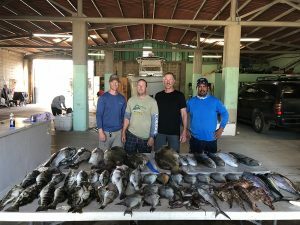 It was a bummer that we were only only able to sneak out of the bay for one day and a short period of time in search of wahoo, marlin, and dorado. But we made the best of it and first day out headed west on a temp break we had been keeping our eye on for some pelagic fish. It seems that the fish are following the same pattern and are closer to the mouth along with the blue water. 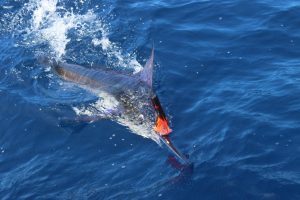 In one day we found 4 nice marlin that wanted to see what our lures looked like hanging off their bills. The guys had there fun and seen enough marlin jumping for one day so we went closer to the mouth to see what we could jig up off the bottom. Various bottom dwellers came over the rail and they had a blast. As I mentioned before due to the fact that Hurricane Rosa was out west we had some weather that shut down the port for the week. 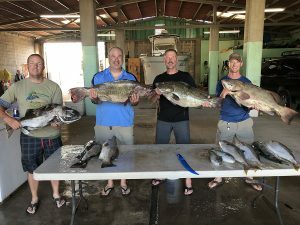 We worked hard to keep these guys on fish and found some awesome yellowtail and grouper fishing off the point. We worked the same area over the course of the next few days and couldn’t have asked for better fishing as if the fish gods new it was out of our control and we needed some action inshore. According to the customers this was 10x better than salmon fishing. They even got to go into the mangroves to witness Pargo jumping everywhere except on the hook.